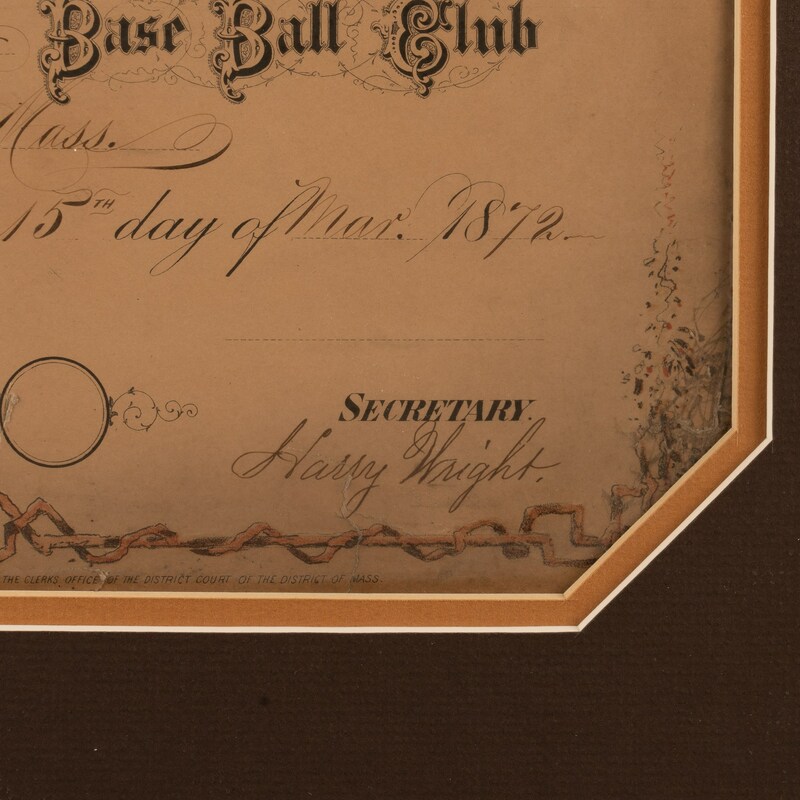 Exceedingly rare and substantial large-format certificate, signed by Harry Wright, proclaiming Charles H. Gould as an active member of the 1872 Boston Red Stockings. 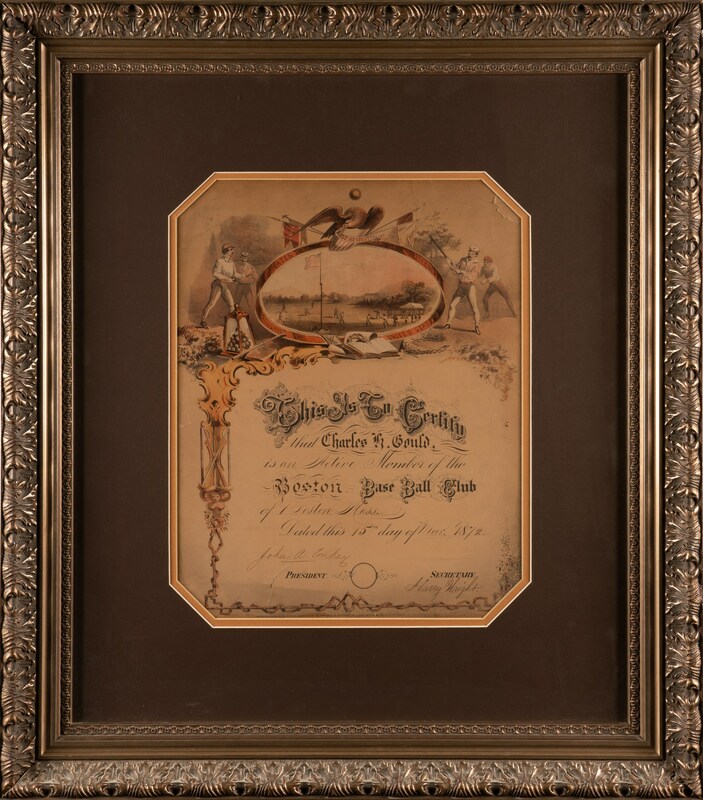 This is the first 1872 Boston Red Stockings membership certificate we have ever seen, and it is most likely the sole survivor. Its rarity not withstanding, it is also one of the most attractive baseball display pieces imaginable. The colorful design features a game-in-progress scene at the top that is encircled by a red baseball belt, upon which sits an eagle holding a banner and four baseball flags. The banner is lettered "Most Respectfully," while the related lettering on the belt reads "Dedicated To The Base Ball Fraternity Throughout The United States." On either side of the central illustration are two generic ballplayers in various action poses. Also pictured within the central vignette is a trophy case filled with a pyramid of trophy balls, a baseball bat, a base, and an open scorebook. 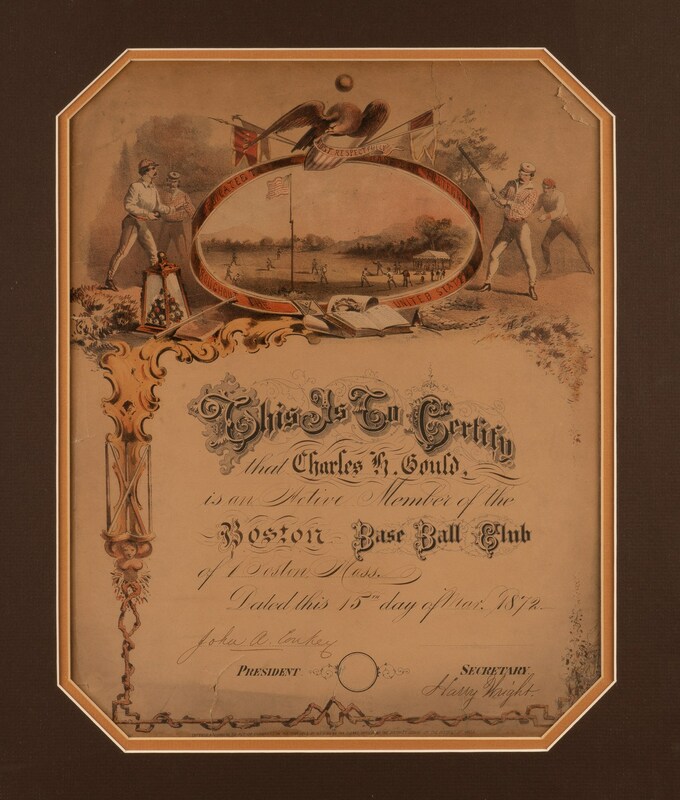 The text, both printed and handwritten in grand calligraphic style, reads "This Is To Certify that Charles H. Gould is an Active Member of the Boston Base Ball Club fo Boston, Mass. Dated this 15th day of Mar. 1872." It is signed in black fountain pen by "Harry Wright," as Secretary, and "John A. Conkey," as President. Wright's first name is affected by a tear, but otherwise the signature grades "9." Conkey's signature grades "8." The Boston Red Stockings were a charter member of the 1871 National Association of Professional Baseball Clubs, which is considered the first Major League. Harry Wright served as player/manager of Boston during the club's five seasons in the National Association. Following the demise of the National Association in the fall of 1875, Wright remained with Boston as manager for six more seasons in the newly formed National League. As noted earlier, this is the first such Boston Red Stockings membership certificate we have ever seen, so we do not know if the club presented them annually beginning in 1871, or, if they did, how long the practice continued. If they did present them annually, it would be reasonable to assume that at least one or two others would have survived, especially given their substantial size and significance. The fact that the offered piece is the only one to have surfaced leads us to believe that they were only presented for a short period of time, possibly only in 1872. Adding to the significance of this piece is that it is signed by both Harry Wright and John Conkey. Wright's signature, as most collectors are aware, is scarce. (This is just the fourth Harry Wright signed item we have ever offered.) Wright died in 1895 at the age of 60, long before autograph collecting became a popular hobby. Also, he wasn't inducted into the Hall of Fame until 1953, so few collectors were actively seeking his signature prior to that time. His late induction to the Hall of Fame is especially curious given his many contributions to the game. Wright ranks among the most influential baseball figures of the nineteenth century. In 1869 he founded and managed the Cincinnati Red Stockings, baseball's first all-professional team. Following his managerial career in Boston, where he won seven league titles combined over the course of eleven seasons, Wright also enjoyed successful runs as manager of Providence and Philadelphia, before retiring in 1893. Wright is credited with developing a number of important innovations still in use today, including the use of hand signals to his players, the constant repositioning of fielders in response to batter's tendencies, pre-game batting and fielding practice, and the use of statistics with regard to managerial strategy. John Conkey, who helped found the Red Stockings in 1871, was president of the club for just one season. He succeeded Ivers Whitney Adams as president in 1872 before turning the position over to Charles Porter in 1873. Charlie Gould was one of the original members of the legendary 1869 Boston Red Stockings. Considered the best fielding first baseman of his day, Gould was the only native Cincinnati player on the club in 1869 and, as such, was a fan favorite. Gould remained with the Cincinnati Red Stockings for the 1870 season and then came east when beckoned by Harry Wright to join him, and fellow Cincinnati teammates George Wright and Cal McVey, on the Boston Red Stockings in 1871. Gould played two seasons in Boston, where he twice led the league in double plays and putouts. After sitting out the 1873 season, he returned to the National Association for two more seasons, playing with Baltimore in 1874 and New Haven in 1875. In 1876 he was hired as player/manager of Cincinnati's entry in the National League. Unfortunately for Gould, his team finished in last place that inaugural season and he was replaced as manager, but he remained with the club as player in 1877 before officially retiring at the end of the year. This piece was originally sold at Christie's in 1993, at which time the auction house described it as having been consigned directly from a Gould family member. The certificate (11 x 13.75 inches; visible dimensions), which is toned, displays a number of small tears (no paper loss), including one that runs through the first name of Wright's signature. In apparent Excellent condition. Matted and framed to total dimensions of 22 x 25 inches. This is one of the most impressive and historically significant baseball pieces that we have ever offered and one that would be the centerpiece of any advanced nineteenth-century or Boston baseball collection. Full LOA from Steve Grad and Brian Sobrero/Beckett Authentication Services. The substantial size/weight of this item requires that there will be an additional shipping charge for this lot. Opening Bid $10,000. Estimate $25,000/$50,000.